Measurements: Frequency, Pulse width, Freq. range, Gate time, Burst freq., Pulse freq. They are ideal for evaluating mobile radio communications devices and circuits, with the ability to measure the carrier frequency and pulse width of burst signals. 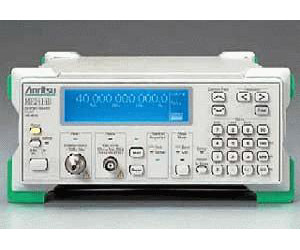 In addition to displaying measurement results on a 12-digit LCD, the frequency values can be read using the analog display function, which is ideal for monitoring evaluation and especially for frequency adjustment, as in the case of various types of oscillators. The template function is useful for assessing quickly whether or not the measurement results fall within the upper and lower frequency limit specifications; the evaluation result is output from the AUX connector on the rear panel as a Go/No-Go signal. An easy-to-use automatic measurement system can be configured using the GPIB function.